The definitive reference guides to Crochet and Amigurumi stitches and techniques - an essential part of your crochet library. Shop for amigurumi & accessory crochet patterns. Choose from my hundreds of original designs, instantly downloadable as PDF files. Perfect your amigurumi technique with my comprehensive library of video and photo tutorials and tips (all available in both right- and left-handed versions). I post about my new designs and tutorials, things I've made, running a craft business, PlanetJune news, and my local wildlife. Keep up to date with new PlanetJune crochet patterns, tutorials, special offers, and more! Ravelry is a free community site and yarn and pattern database for knitters and crocheters. In the PlanetJune group on Ravelry, you'll find crochet-alongs, pattern support, crochet chat and socialising in a friendly and helpful environment - please join us there! Hello! 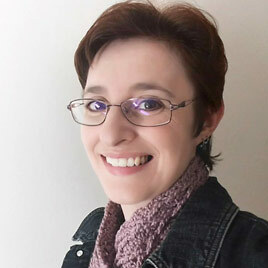 My name is June Gilbank, and I'm a crochet pattern designer, crochet and craft book author, and multi-crafter. My crochet specialties are cute and realistic nature-inspired designs and elegant accessories, and I'm committed to creating exceptionally clear, accurate patterns and tutorials. PlanetJune is a one-person business, so you'll find everything 'June' here: my crochet patterns and tutorials, my punchneedle embroidery and papercraft ranges and other craft tutorials, and even the occasional post about my other passion, wildlife and nature!